Part of an ongoing series about processed foods that get my approval. This post was originally written in March, 2009. Updated in 2011. Upon reading this weird tangential posting comparing Milo with Astros announcer Milo Hamilton, I had to revisit my old posting about Milo, the drink, written 2 years ago, and brought forward. I have fond memories of having Milo (can't really say it's a drink, as it can be consumed in myriad forms). I'm not really sure where to categorize Milo. It is a product by Nestle is that is pretty popular the world over, except in the US (or maybe the UK). The Wikipedia entry on Milo says that the stuff originated in Australia, although the can I pictured above comes from Canada. In Malaysia and Singapore, it's so popular that Milo is practically synonymous with chocolate drinks. It's a malty chololatey powder in its default form, which is supposed to be mixed into milk or water to make an old fashioned energy drink (high calorie vitamin fortified stuff - not the caffeinated canned stuff most energy drinks are today), but it gets used in other products - I have baked Milo bread, and made Milo ice cream. Milo can be sprinkled on oatmeal, blended over ice cream, mixed into coffee, made into milkshakes. You can get Milo pressed into bars and coated in chocolate. The canned ready to drink stuff - boring pablum. Do I really know what went into Milo? No, not really. But it's damned good stuff, and I'm loyal to it (don't even bring up Ovaltine as a comparable product - it isn't). I understand that there are subtle differences in the regional manufacture of Milo (for example, I've never seen Ghanese Milo but I hear it comes in pellets). I've met other people (usually expatriates) who drink Milo, and we get together to chat excitedly about the stuff like junkies who found long lost brethren. This post brought a smile to my face. Milo reminds me of my childhood. Back in high-school in Singapore, my buddies' and my favorite drink would be "Milo peng" - iced Milo sweetened with condensed milk. And then there's the "dinosaur". Partially foamed Milo ('tarek' - from pouring it back and forth between two cups) finished with a generous sprinkle of Milo on top. I remember Milo from growing up in rural Illinois in the 1940s and 50s. 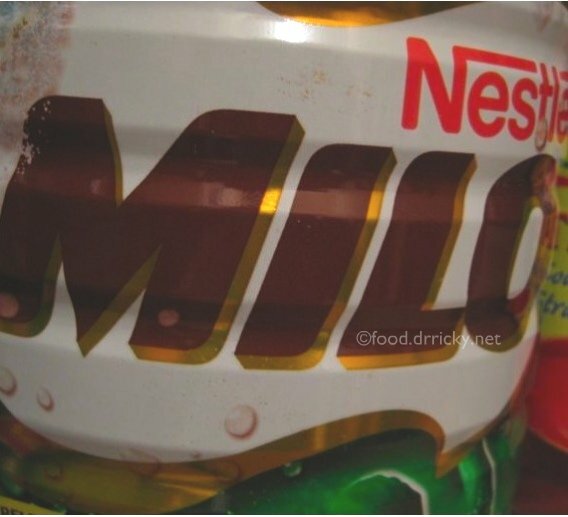 A milk-based chocolate drink called Milo was marketed like and with Pepsi or Crush, in a transparent pop bottle, in the cooler at the gas station, or in the small grocery stores. Lots of places didn't have it, but many did, and if you liked it you found out which. Disappeared some time during the 50s; haven't seen any since then.